About a year ago, I posted an essay suggesting that not lying may be the most important of the five precepts of Buddhism (guidelines for lay Buddhists). In that essay, Buddhist morality and signaling, I said that the precepts can be understood as signals coming from the mind and that as such the morality of the signals themselves is of paramount importance. If you don’t lie, you won’t kill, steal, do sexual misconduct or use alcohol irresponsibly because breaking any of the other five precepts will cause you to conceal what you have done or lie about it. It’s a long, bad, slippery slope from there on. I would hate myself if I did that. 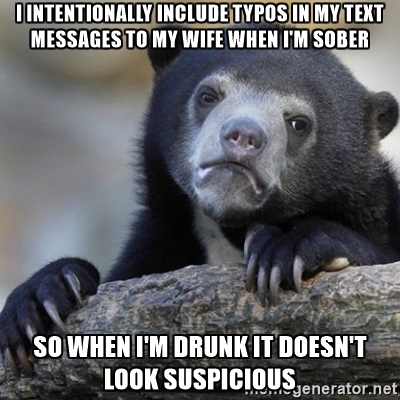 When I mentioned this meme to my partner this morning, she said that she had read about an alcoholic who started lying to her family about her drinking. The first time, the woman said, her lie made her feel a little distant from them. Before long, she felt so far away she couldn’t even remember where they were anymore. This illustrates the power of the mind. If you are willing and able to accurately monitor your mind and report on it truthfully to your partner, you won’t even start down a bad road like the author of the meme or the woman who chose booze over her family. Alcoholics are notorious liars because the condition all but forces them to lie to their most intimate companions. The booze itself causes the lying. The yeast that makes alcohol is like an off-site parasite that gets food from its “hosts” by forcing them to buy the waste products of its metabolism. Note: I put up a fair amount of stuff on alcoholism on this site because I have witnessed the devastation of this condition up close with several friends. I also post on this subject because I know that the condition is greatly worsened by its being very hard for most people to identify during its early stages. Alcoholism often starts in the mid to late teens, sometimes earlier or later. Normally three stages are recognized. 1) the early stage during which the future addict is just drinking a lot but may not be addicted yet; 2) the middle stage where the addict is addicted and knows it and is probably lying about it; 3) the last stage, which is the stage everyone recognizes. In this last stage, the alcoholic typically is unhealthy, sloppy, and no longer conceals their drinking (which is less than before because their livers are damaged). I think that if I had known more about alcoholism and how it progresses, I would have been able to help several people who were becoming alcoholic. I would also have prevented at least some of the harm they did/do to others. I honestly feel bad about not having recognized the symptoms of early and middle stage alcoholism. I mistook it for good times and sensitive, artistic natures just going a bit too far. What I was actually witnessing was good people gradually turning into abusive drunks.